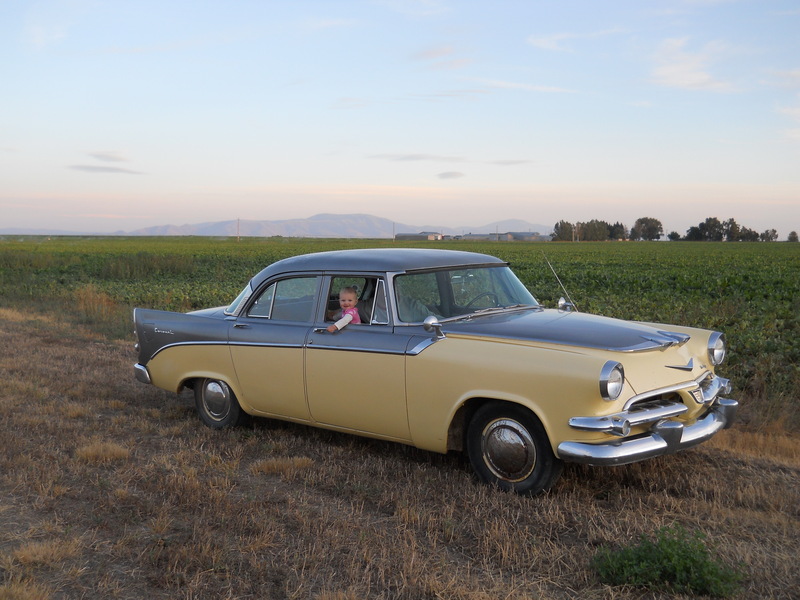 Notwithstanding applying for jobs, fretting over passing the bar, putting things in place for solo practice, and helping around my Dad’s house, I have made an effort to resurrect my 1956 Dodge from the garage. Here is how dirty about five years had made her. She had so much dirt that some of the seams, like around the trunk, were full of dirt. The battery was dead so I put a new one in. As a tribute to Dodge, a new battery and the car cranked over and started up after about 30 seconds! I had absolutely no brakes, but I moved it into the driveway where I could more easily work on it. I gave her a good bath and washed off more than a few millimeters of dust in several places. There in the driveway I bled the brakes, vacuumed her out (and her numerous mouse nests, what a heart-breaker), and prepped her for more use. We still have some of the original marketing materials that came with the car in 1956 and I knew one of the marketing themes was “Oh, You Beautiful Dodge!” I knew the song was “Oh, You Beautiful Doll” modified for Dodge’s purposes (and with the help of Lawrence Welk). So that one line I kinda hummed under my breath as I worked through my various tasks. I decided I would check to see if I could find the commercial. Voila, Youtube has a copy. Kinda catchy and I am jealous of the singer’s low voice. There is another interesting commercial about the creation of the Dodge as a piece of art, as an automobile. Since money is tight, some of the necessary fixes will just have to wait. I am afraid the master brake cylinder will have to be replaced as well as the cylinders in both back brakes since they grab and both seem to be leaking brake fluid. One of the valve covers appears to have the gasket completely missing so she throws out a healthy dose of oil when she gets hot. Additionally, the transmission which slipped even 10 years ago slips worse than ever. 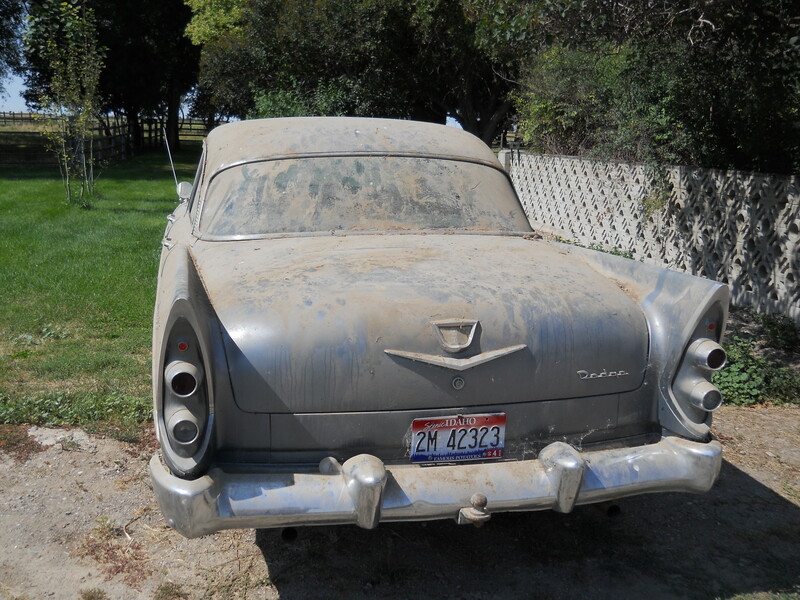 Storage is never good on a vehicle and where the dirt has sat on some of the fenders and a little moister have added some rust bumps in the paint. She has some cancer in a few areas. I am afraid she will need a good going through and probably a paint job to restore her to her true colors (white top of the cab, charcoal not grey, and yellow which is pretty close). Here is a picture of her all cleaned up on the outside, I have not done anything beyond vacuuming inside, with Aliza and me. I hope we can get her squared away to make her a regular Sunday driver. This entry was tagged Aliza, Dodge, Welk. Bookmark the permalink. 5 years of dirt, phew! She looks nice now. I still remember getting to ride one time. Have fun restoring. I LOVED riding in that car!